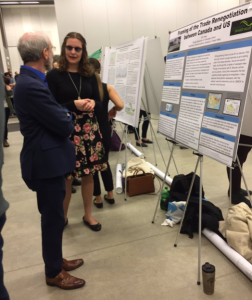 On March 26, 2019, University of the Fraser Valley students from a variety of faculties presented their research findings with posters and mini-lectures at the annual Student Research Day in Evered Hall on the Abbotsford campus. Several individuals and teams presented projects related to social research and won awards for their outstanding work. We are proud to highlight them here. Christine found that when she began the project, people would often ask for her opinion on MAiD, although she feels that the “opinion of the nurse innately shouldn’t be considered for a patient requesting MAiD.” This dichotomy intrigued her and spurred her interest in her research question. 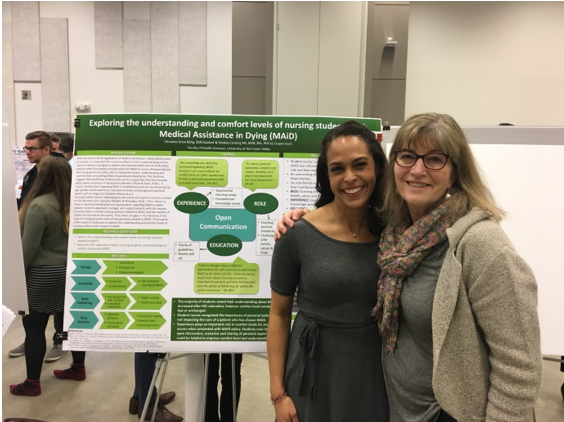 In reflecting on her research, Christine stressed that “it is vital that nurses reflect and be aware of their values and beliefs surrounding MAiD so as to provide impartial patient-centred care,” which points to the importance of education for nurses on end of life care. 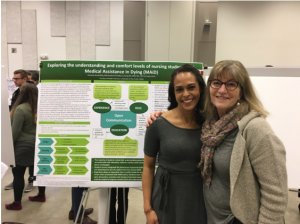 Christine will be presenting this study in May at the UBC Graduate Nursing Student Association annual symposium, and will be graduating in June. Psychology student Caroline Duncan won the $200 Dean, College of Arts – Social Sciences Award for her poster presentation on “Loneliness, Resilience, and Cognition of Older Adults.” Duncan’s research was supervised by Dr. Lesley Jessiman, a psychology professor and member of UFV’s Centre for Education and Research on Aging (CERA). Dr. Jessiman’s work with CERA has looked at issues related to improving quality of life for aging populations, researching ageism and higher education, and the effects of typical aging on emotional and cognitive functions. She points out that Caroline’s research has is “particularly important given the growing older adult populations in the Lower Mainland, which is where the data was collected.” As a mature student, Caroline shared about the relevance of her research to her own life as she cares for her aging father, who has “struggled with loneliness and loss of his resilience when faced with adversity later in his life.” Caroline’s interest in completing this project as part of her honour’s thesis for her psychology degree grew after taking UFV’s Adulthood and Aging course. The research also connects to the intergenerational aspect of aging, because, as Caroline puts it, “We are all hopefully going to be given the opportunity to grow old in our lifetime, and loneliness does not align with our human nature.” The chance to interact with participants and learn from their life experiences was a highlight for Caroline as she conducted her research. 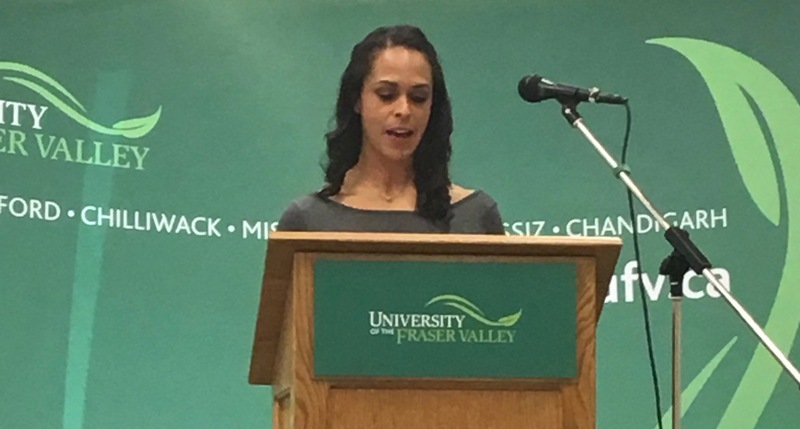 She hopes that this work pushes UFV to integrate a gerontology program for students. Dr. Jessiman hopes that the research “will help inform policy by identifying specific means with which to reduce levels of loneliness among our aging populations,” which has been recognized by the World Health Organization as a significant factor in rising morbidity and mortality rates in older populations. Both researchers hope to continue a second phase of the study with semi-structured interviews of a wider sample set. Business students Allan Les, Ford McMahon, and Simeon Gellert were awarded the $200 Vice Provost and Associate Vice-President, Academic Award for their poster presentation on “Crime Rates in Canada,” supervised by Professor David Dobson from the UFV School of Business. As part of David Dobson’s Economic and Business Statistics course, the team developed a research question focused on whether there is a correlation between a local police force and lower crime rates. The group focused on Surrey’s expensive decision to switch from RCMP to a local police force. Based on a statistical analysis, the team concluded that there is a positive correlation between having a local police force and lower crime rates. Although this was a strong factor in reducing crime rate, they also found that socioeconomic factors played an even more significant role, stressing that, “In order to ensure continued decreases in the local CSI (Crime Severity Indexes), Surrey’s City Council should continue their work to encourage post-secondary education, stable families, and economic development to provide well-paying jobs.” Although this project was not directly related to the business program, Simeon Gellert stated that it was an enjoyable project and he hopes to work with Allan and Ford again in the near future. We congratulate these students for their excellent contributions to social research which not only enriches the UFV academic community, but also has important applications in our wider communities. 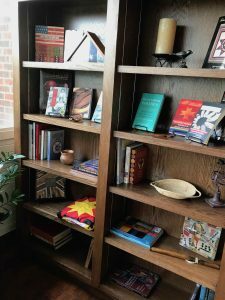 In case you need a reading recommendation… here are six great reads that could help raise your intercultural competence along the way. 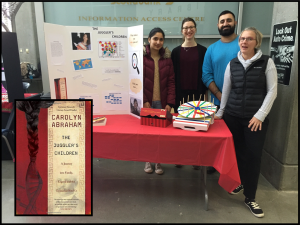 On March 13, during Valley Fest week, the students from Communications 180 showed off their semester project. They spent the weeks leading up to the event reading, reflecting, and planning. It wasn’t easy. Their job was to pick out concepts from the book that they were also studying through other materials in class and be able to tell their audience why their particular book was a good way to learn about that concept. It was my pleasure as the instructor to spend the previous summer reading through a dozen wonderful books to pick ones that would engage, intrigue, and also connect to real life Canadian stories of challenging intercultural encounters. Connecting the assignment to Valley Fest seemed the perfect vehicle to press the students to do their best and the rose to the occasion. Of course the project had a broader goal as well; to work towards meeting the Truth and Reconciliation Commission’s several Calls to Action that ask again and again for institutions to increase the levels of intercultural competence for professionals and all Canadians. 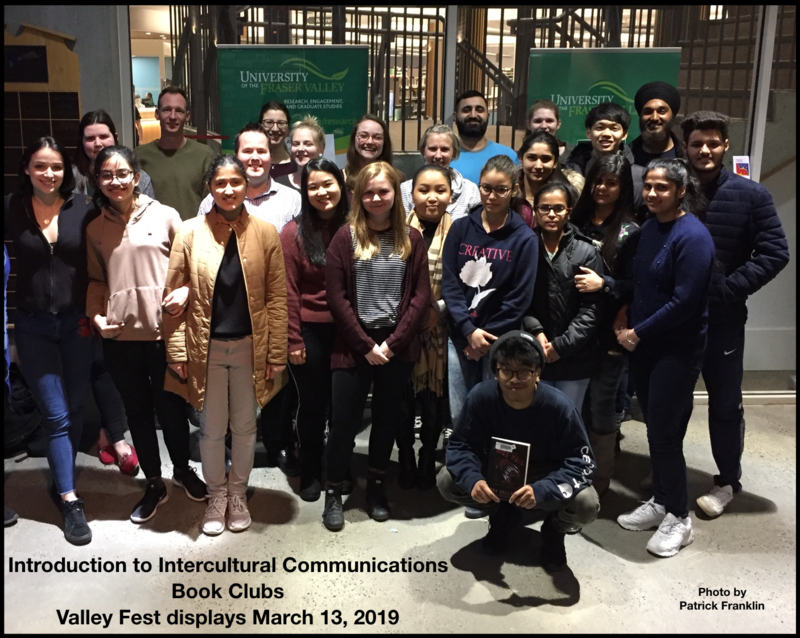 This is also a great place to announce the exciting news that while the Introduction to Intercultural Communication course has only been running once a year for the last several years, it will run twice in the 2019-2020 academic year. Check out the timetable for one section in Fall 2019 and another for Winter 2020. Hot on the heels of Dr. Mai Anh Doan’s talk at the Scholarly Sharing Initiative event this month about financial communication as it relates to crowd-sourced fundraising you will have a chance to catch up on a research project undertaken by another member of the Communications department, Dr. Marcella LaFever at the upcoming February 13 event. Marcella, in examining the implications for herself to decolonize her communication practices, has focused her ongoing research program on listening to Indigenous voices that have been saying for a long time what colonizers need to do to change their attitudes and practices. 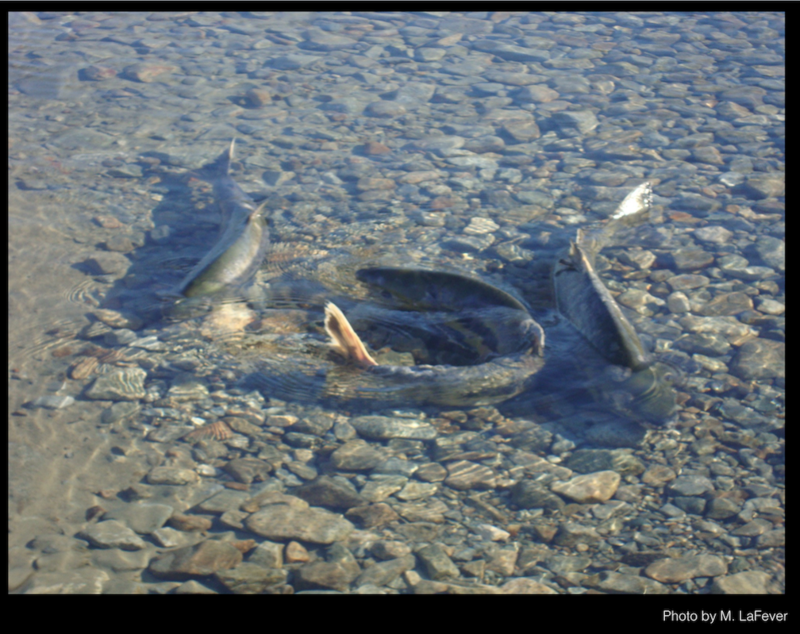 Dr. LaFever’s current work alongside Shirley Hardman (UFV’s Senior Advisor on Indigenous Affairs) investigates use of First Nation storytelling as a form of dialogic participation, specifically in relation to how stories were used by Indigenous participants in submissions to the 2010 Cohen Commission on Decline of Sockeye Salmon in the Fraser River. The presentation will ask participants to engage in a discussion investigating the validity of using this as a qualitative coding framework. For years now, when people asked me why I didn’t have a cell phone (no it wasn’t because I refused to keep up with technology) – I would tell them “as soon as a carrier makes it seamless to cross over the Canada-U.S. border and still have service, I will get one.” Finally this year, a Canadian carrier figured it out and the price stabilized to something reasonable. I signed on. I traveled last spring and everything worked as promised. No extra charges; coverage 100% of the time (excluding super remote rural areas of course). However, on my most recent trip I ran into a few problems, not the fault of my carrier but more related to the nature of my phone use – I was contacting friends and family to make plans for visiting. I was merrily texting and leaving phone messages. 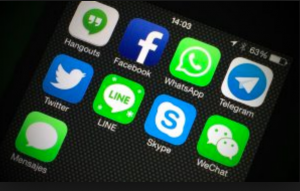 I did realize that for many people the only contact method I had for them was Skype, Facebook via messenger, or ultimately through email which we had been using for years because phoning was just not an option for them or for me given cost and borders. My granddaughter was asking me why I had her blocked. I was horrified – of course I didn’t have her blocked. We figured out it was because she could get my texts and voice mail but she couldn’t reply because she didn’t have either an iPhone or a service that let her respond to a Canadian phone number [No wonder I wasn’t getting answers from a few people I expected to respond]. 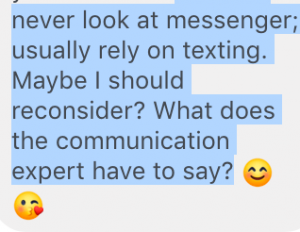 I asked her what other messaging she used besides sms and specifically whether she used messenger – her answer “nothing” and “no, I don’t like it.” How is that for not wanting to keep up with technology, and she a post-millennial? We settled on email, but really, I know and you know that isn’t going to work, right? One friend and I have always connected through skype and we settled that we would just keep doing that. I long ago cut down on skype use so I am not sure how well that will work. Another friend who I have only ever connected with through FB sent me the message above and asked me the big question “What does the communication expert have to say?” I don’t know what to tell her but this has made me question how we stay in touch in such a globalized world and reminded me why “communication” can be so complicated (this particular example is merely a symptom). Interestingly, searching the net doesn’t give us much of an answer about what to do when traveling internationally. There are of course things like buying a new sim card for each country (you can imagine the complications here I am sure); or there is advice on how to find free or cheap WiFi (not all that helpful); and then of course the least helpful perhaps, one-way stuff like write a blog or send a postcard. If you can get everybody onto the same app maybe that’s a solution but good luck with that venture. So – no solutions here but feel free to comment on what you do to stay connected and make meet-up plans while traveling internationally. 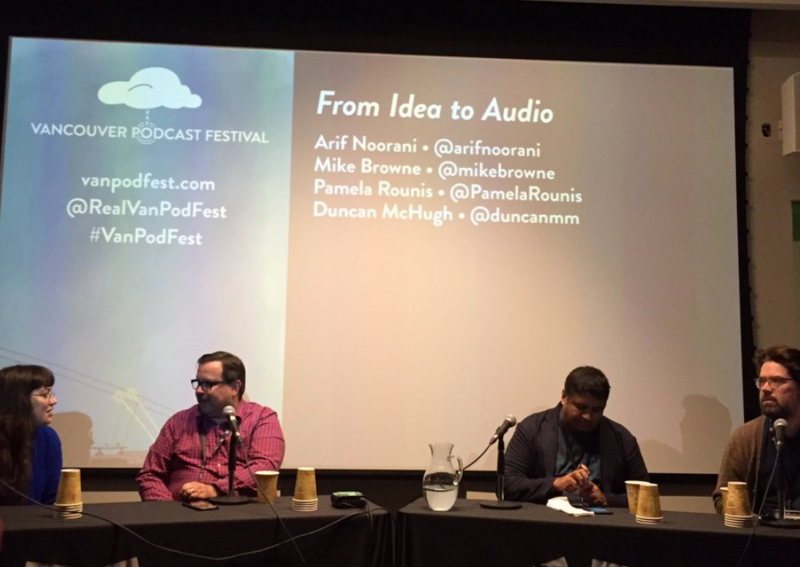 From its roots as audioblogging in the 1980s to its reinvention with the release of the iPod in 2004, the phenomenon of podcasting seems to have skyrocketed in recent years. 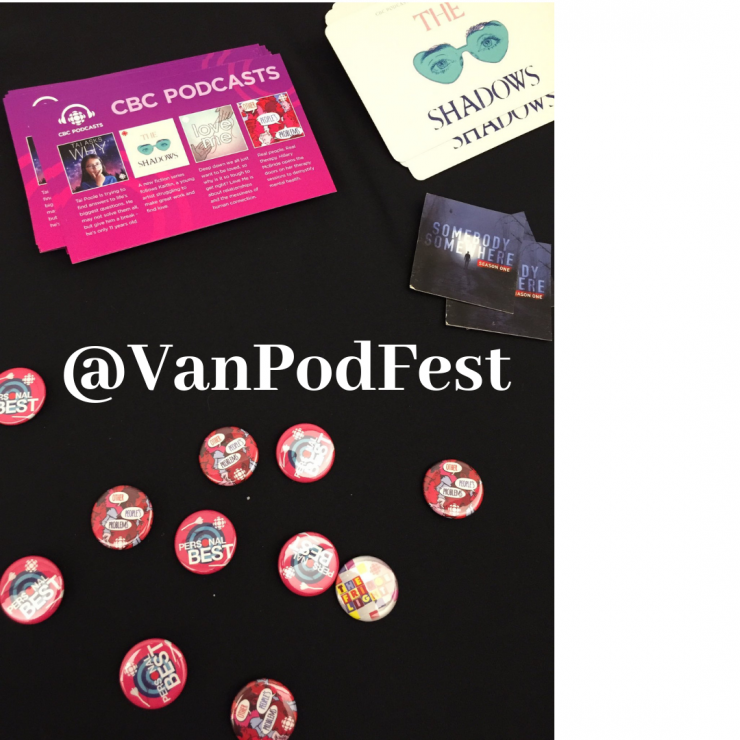 The inaugural Vancouver Podcast Festival just took accessibility to the digital world to a new level this past November 8th to the 10th. I could only attend the Friday sessions but it was nice to bump into Jess Wind through the twitterverse while waiting for the panel discussion on “Idea to Audio” to commence. Jess was waiting eagerly for the livecast of Hannah McGregor’s podcast Secret Feminist Agenda in the next session but it seems we did have at least one thing in common – getting some tips on starting a podcast from a fantastic panel that included some people that even other successful podcasters were eager to hear. I truly wish I could have made it to the rest of the festival but I am pumped to finally get the Outdoors Golden podcast up and running soon. 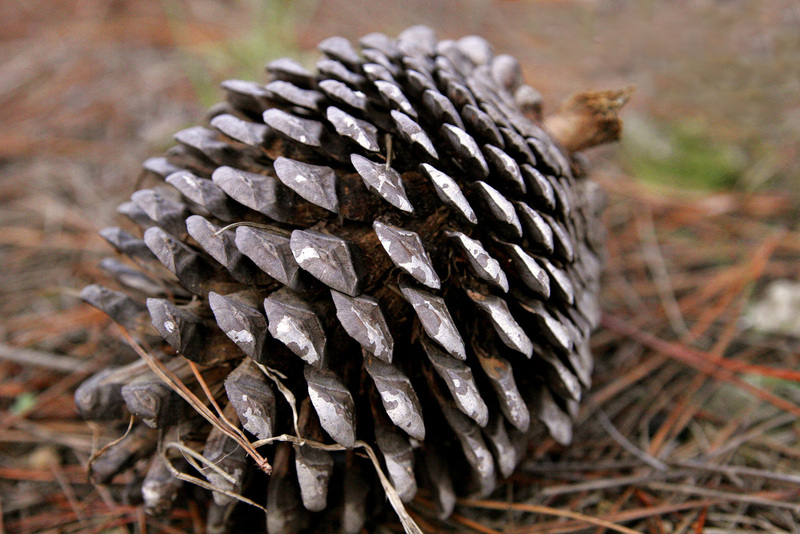 What happens when you soak pinecones in water? 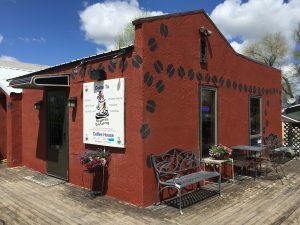 They close. And how do you get them to open up again? Well, either put them under direct sunlight (something we miss during these winter months) or put them in an artificially hot setting such as an oven. In both cases, it will take more time for them to open up again. 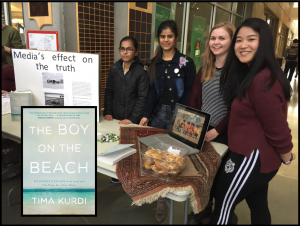 The metaphor powerfully reminded us, twelve members who sat in the University of the Fraser Valley’s very first New Faculty Development Program, about the importance of creating an open and inclusive classroom environment for students. 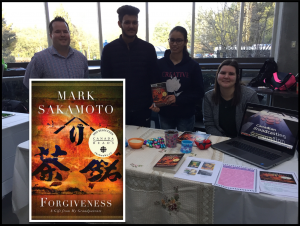 On every Friday afternoon, for 11 weeks, we switched to being mature students and tackled the most essential issues of learning and teaching at UFV. The classes were always full of ideas and energy as members discussed and shared their teaching experiences with each other and with facilitators from the Teaching and Learning Unit and guests. In the first half of the program, we re-examined seemingly traditional concepts such as student motivation, engagement in learning, learner community, experiential learning, and positive collaboration. Classic reads, for example, Freire’s banking concept or Mezirow’s transformational model of learning were used as starting points for further in-class discussions on their implications for various disciplines. We were also treated to hearing stories from students and seasoned faculty members who designed and participated in elaborative experiential learning opportunities that made life-long impacts. For the second half of the program, we immersed in the sea of educational technologies. Some of the members are very well versed in this area, and all of us learned something from everybody. Through a Blackboard discussion, we built an impressive repertoire of the technologies that consists of well-known and well-used tools such as PowerPoint, or Blackboard Collaborate, and newer, cool programs such as Zeetings, Socrative, VoxVote that get students to participate in class in real time. 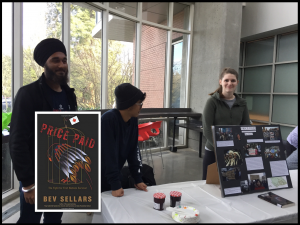 But perhaps, the biggest takeaway from the program was the opportunity for us, newbies to UFV, to network with peers from other departments. Some of us are already talking about cross- and inter-disciplinary projects that help students see their subjects of study under different lights. As the program continues next semester, we are in fact looking forward to seeing some of these projects come to fruition. It started off as a trip to help out a colleague who was having eye surgery in Albuquerque, New Mexico. 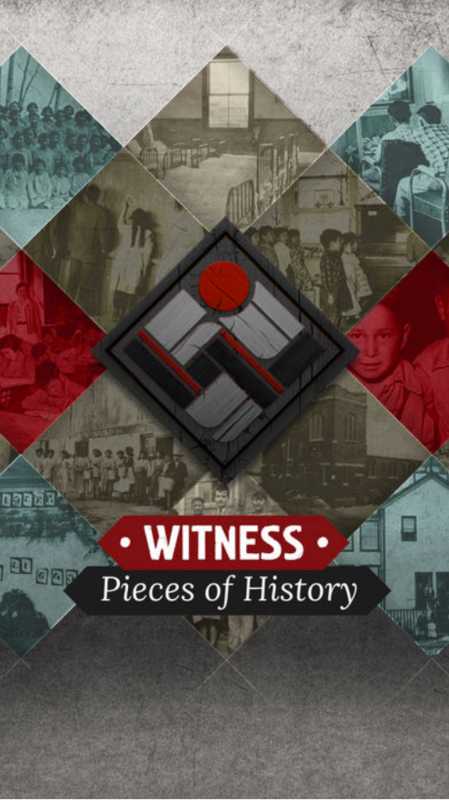 In the end it became a journey of thinking about when, how and what Indigenous peoples in the United States when they tell their stories publicly. 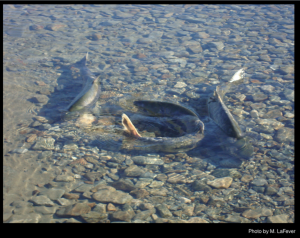 For this past year I have been immersed in my sabbatical research on Indigenous storytelling as a communicative practice in public dialogue, in particular in relation to use of stories in submissions to the Cohen Commission Inquiry on the decline of Sockeye salmon in the Fraser River. When my co-researcher Shirley Hardman accepted my invitation to fly down and drive back with me on the return trip we quickly decided that we wanted to visit a couple of universities with strong Native American Studies programs and plan our route to visit Indigenous communities along the way. 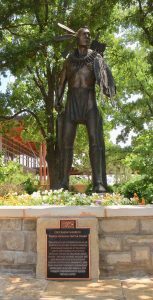 As we started our travels from Dallas/Ft.Worth Texas we headed just north to the state with the largest Native American population in the U.S., Oklahoma. 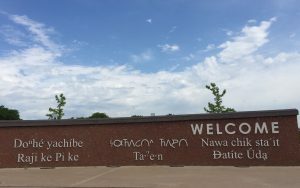 Our main goal was to visit the University of Oklahoma but we also wanted to stop wherever we saw First Nation sites along the way. 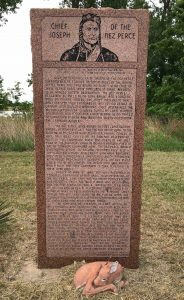 This ended up including roadside markers such as the story Chief Joseph (left), complexes such as the Chickasaw Cultural Center, Sulpher, Oklahoma, and interactive memorials such as the Standing Bear Monument in Ponca City. Each of these were channels for telling stories publicly. There are many other ways of course and I will touch on some of the others we experienced later in the blog. At the Standing Bear Park we were a bit wary as we drove through a major refinery to get there. Never mind that further research showed that some of the oil being refined comes through Keystone from the Alberta oil sands and that oil played no small part in the despicable policies that displaced these First Nations peoples for a second time; the first being when they were forced to locate to Oklahoma territory by the U.S. Government under the Indian Removal Act that resulted in what is called the Trail of Tears. Nevertheless, the story and site we experienced when we arrived was well planned for those who wanted to be engaged. 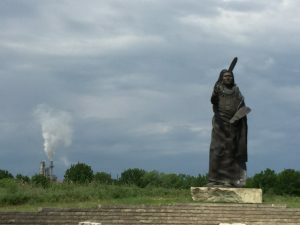 We were greeted in the five languages of the local First Nation peoples and led through an outdoor interactive site that led us clockwise through the lives of the Osage, Pawnee, Otoe-Missouria Kaw, Tonkawa and Ponca communities, ending with the nearly 7 meter (22 ft) high bronze of Standing Bear. After hearing the story of Standing Bear and learning of the peoples of the area we ventured into the Museum and Education Center to see other ways the stories were told. Inside the circular architecture of the center each of the five nations had their own case to display whatever they wished and included such things as art works, current event mementos, and some heirlooms. 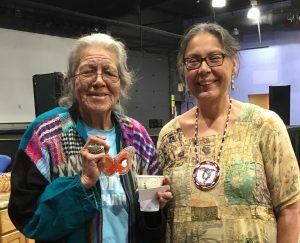 The center also hosted traveling exhibits, a display featuring all the models and the sculptures submitted as proposed designs for the Standing Bear bronze, contemporary artwork and pottery for sale, as well as a good selection of books. Clyde Otipoby (Comanche) was the featured artist when we were there. Soon after leaving Ponca City we made our way to the University of Oklahoma and the Native American Studies Program in Norman with the goal of finding out what American universities might be doing to indigenize their campuses. We spent a fantastic afternoon escaping the 30c heat and it was great to be in the university atmosphere. No one even blinked (although they did smile) at our traveling companion Rocky (#rockyrapido). chment Programs. Jarrod (Comanche-Choctaw), Norman born and raised, got us excited about what was happening on campus, showed us how to get to Breanna Faris (Cheyenne-Arapaho), Assistant Director for American Indian Student Life, and from there to the office of Dr. Amanda Cobb-Greethan, the Chair of the Department. Amazing, everyone was on campus despite being after end of term. We were also impressed with such things as the elevator that was completely clad in a historical photographic mural of what we could only imagine was a local Indigenous community (no interpretation was provided). 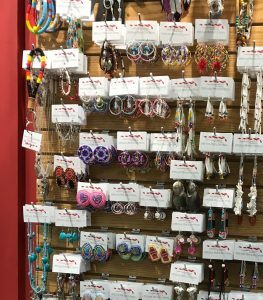 Both Jarrod and Amanda ensured we were OU American Indian bling equipped before we left campus – a definite plus to make us the envy of tribal members back home. While doing our homework ahead of our visit we had found that it had been more than 100 years earlier that the department had been established and the promise of their own building made. While that goal has still not been achieved, Dr. Cobb-Greethan was quite happy to show us around the entire floor that they occupied. We were greeted by a guest book and map where visitors were encouraged to add their Nation identity and pin a map (the one created by Aaron Carapella). Amanda also explained to us that there are 39 tribal groups in Oklahoma and that each was represented by the flag of their Nation posted the length of the hall. She also pointed out that there was plenty of room for any student who came to the program from outside Oklahoma to bring a flag to post as well and that they were actively encouraged to. The star quilt, which we saw over and over again on our tour, and which we carried home adorning our bling, has significant meaning at OU. The quilting, undertaken to produce these various stars, was learned in Indian boarding schools. 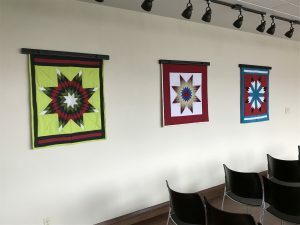 There is an act of reclamation in using the quilting learned in those place of cultural dispossession and the “star” as it has become an accepted pan-Indian design, to create the star quilts today – this act termed by those at OU as a cultural sovereignty. These are a couple of ways that students can tell their stories in a public way. Again we had a wonderful reception as we found our way around the University of South Dakota looking for Native Student Services and Native American Studies. First we met Donis Drappeau (Ihanktonwan Oyate) at the Native American Cultural Center that houses the student services and acts as a study and gathering place. We heard not only some of her story but stories of the center and successes of the students. The NACC was undergoing summer renovations and much of the furniture and aesthetics were shoved to one side to allow the reno workers access to the Centre. 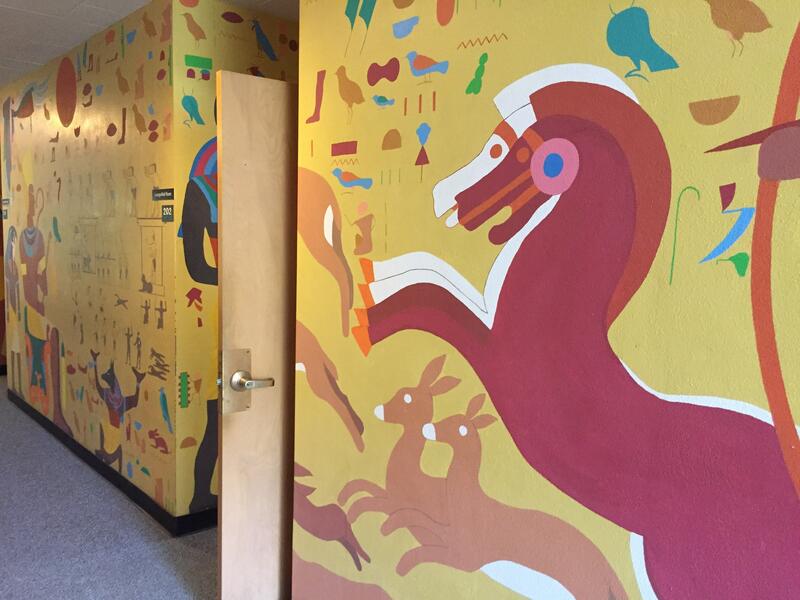 What remained on the walls were seven core-values (Humility, Generosity, Sacrifice, Fortitude, Compassion, Wisdom and Respect) translated into Lakota, Nakota, and Dakota. Donis then pointed us in the direction of Dr. Elise Boxer (Assiniboine – Oglala Sioux) , Coordinator of the Native American Studies program. Elise was very proud of the department’s direction in changing from one that focused on the past to one where classroom and research is rooted in the present and looking to the future. Dr. Boxer’s office was crowded with sewing machine boxes, when Shirley asked, Elise explained that the sewing machines are part of her community outreach. From Vermillion we head due west across the plains though Sioux territories. Beadwork had brought us stories all along the way as we stopped in First Nation Communities. Shirley says the “raven” in her cannot resist shiny things and beadwork qualifies as shiny things. Anyone who knows Shirley know that she wears beautiful beadwork made for her by her niece Collete Williams, Skwah Band member. Many people will comment on the beadwork Shirley wears but it is only in First Nation communities where people bring stories to the conversation. For example when we stopped for the night at Rosebud we met the lovely Elsie Huber. Elsie explained that she had lived on the Rosebud reservation almost her whole life. She went on to explain that it is the best place on earth and that now more than 80 years since she was born she is rich with children, grand-children the land she loves and the dawning of each new day. More stories came as we traveled through Wounded Knee, Pine Ridge, at the Crazy Horse Monument, the Little Bighorn Battlefield, and Head Smashed-In Buffalo Jump. So many of these stories ask of us a solemnity that the area demands. 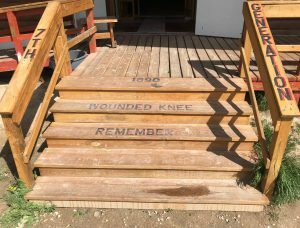 At Wounded Knee we offered tobacco, hiked the muddy road to the monument, spoke with hovering locals hoping to secure a few dollars to get them through one more day from the tourists who persist. It was a windy, cold day when we offered more tobacco at the Little Bighorn Battlefield, at a time of year just one month before the annual commemoration. The City of Abbotsford, the local municipal government for UFV’s main campus and Clearbrook campus, identified a problem. That problem is neither new nor unique to Abbotsford: people mostly don’t care about municipal governance. As hard as municipal governments may try to engage their populations, as many channels as they may have to communicate with their residents, as many opportunities as they may provide, local governments tend to hear frequently from a small group of very engaged citizens and then from almost nobody else. However, the City wants to change that. They put a tremendous amount of effort into engaging around the Abbotsforward project and again for their Plan for 200k initiative. Still, despite receiving input from thousands of people, the City wants to do better. Enter CityStudio, a group that has been working with the City of Vancouver and post-secondary learning institutions in Vancouver to advance innovative projects at the local level. CityStudio looks to connect municipal staff with universities, faculty, and their students to open new opportunities to explore problems and how they might be solved outside of the confines of city halls. The City expressed a number of challenges to CityStudio, including their problem about civic participation and engagement in municipal governance. 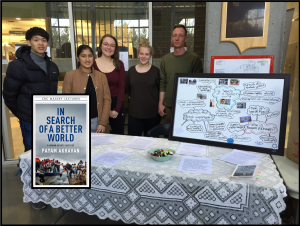 When the University of the Fraser Valley started to get involved, two faculty members—Hamish Telford from Political Science and myself from the Communications department—came together to build a new Interdisciplinary Studies 400 course: IDS 400f Civic Engagement & Participation. The goal of this course is simple: bring together a small class of committed students to investigate the City’s problem and propose potential solutions for future implementation. While the goal is simple, the problem also presents an enormous challenge and a very unique learning opportunity for students. In this course, students will need to consult with City staff and the Mayor about the challenge being faced and they’ll need to research what has been tried elsewhere in the past, even of those experiments with public engagement were failures. 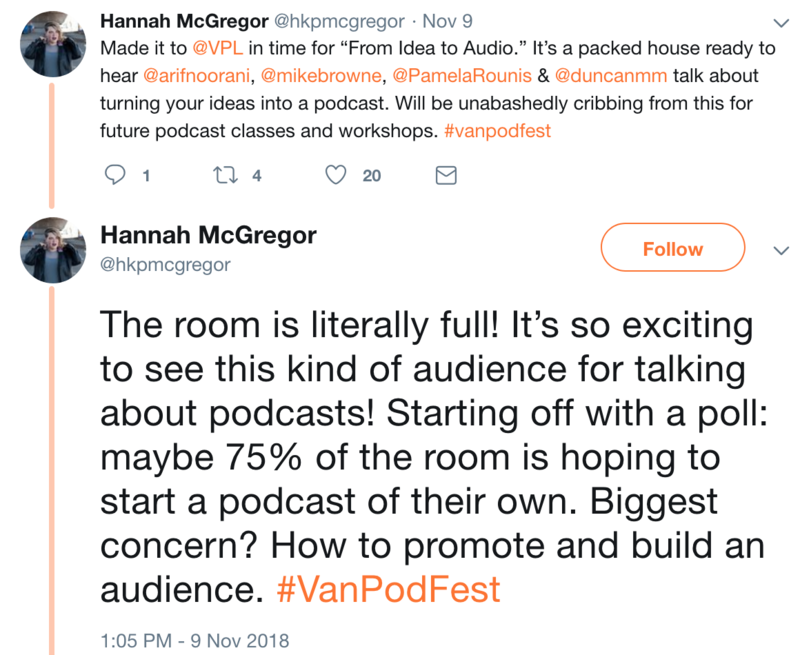 They’ll need to go and perform original primary research to speak with the marginally engaged population to find out what might motivate them to be more engaged and to participate more in the public policy development processes that the City offers for citizen feedback. IDS 400f is a different kind of course. Student led and project-based, this course gives students the unique opportunity to explore communications and politics outside of a traditional disciplinary framework and to solve a real-world problem through hands-on research and interactions. If all goes as planned, the students will bring new perspectives and input into a problem that has plagued many. They will learn about the challenges that are faced when planning how to overcome meaningful problems that have stumped expert practitioners. 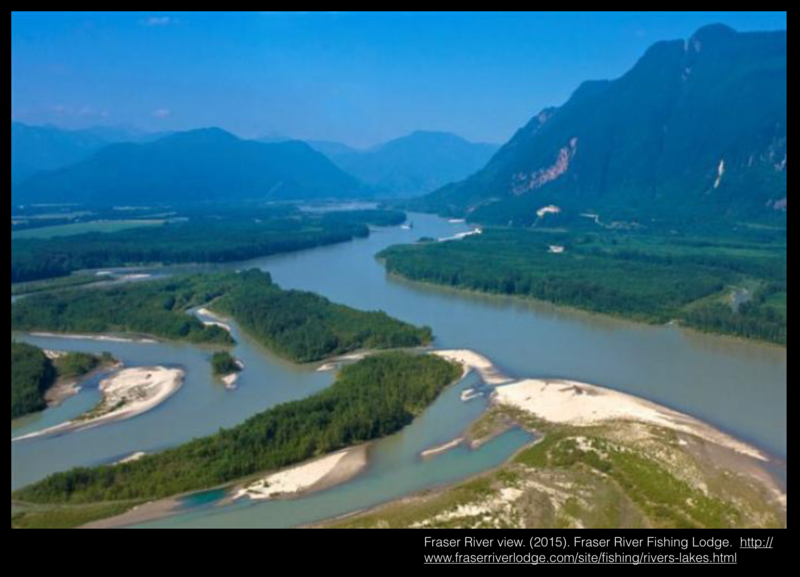 The richness of the experiential learning will transcend the traditional classroom experience or even traditional academic research because of its time sensitivity and client-focused approach. The learning students achieve in this class will be a talking point if they apply for graduate programs or future research or teaching assistantships. This is going to be a unique learning opportunity that forms their understanding of what can be achieved through research, project-based learning, and experiential learning for years and maybe even decades to come. On that basis alone, I am a strong believer that UFV’s students and faculty should push for more such learning opportunities that connect to community stakeholders, that are project-driven, that are interdisciplinary, and offer opportunities for primary research. Such courses foster creativity and innovation and they serve as an excellent primer for students looking at graduate level research in their future. They represent an excellent capstone to the undergraduate learning experience. Will the efforts of IDS 400f students solve the City’s problem? I don’t know. But the process is exciting and the learning will be enriching at the highest level. The opportunity to learn, connect, and grow is incredible. 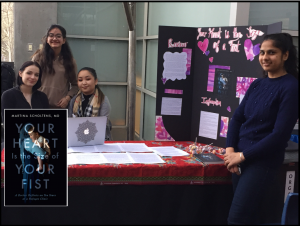 Last Week the University of the Fraser Valley co-sponsored our local undertaking of the 2018 Women’s March in Chilliwack. The march, started after the 2017 presidential inauguration in the United States, seemed to coalesce a call for more women to be involved in electoral politics by running as candidates at all levels of government. 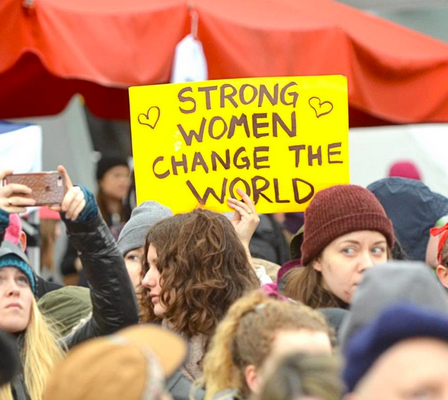 Canadian women also have taken up the call but are reminded by current women political figures like Christy Clark and Elizabeth May that they will have to be strong and determined. On top of that women will need to study up on communication and the skills they will need in all arenas of politics – not to become like men, but to let their own style and message be heard loud and clear. Women have many years of research on gender, politics, and communication to get them started such as volumes like Gender in Applied Communication Contexts, edited by Patrice M. Buzzanell, Helen Sterk, Lynn H. Turner or Gender and political communication in America: rhetoric, representation, and display edited by Janis L. Edwards. Probably a more engaging way to discover tips and tricks to practice is through the medium of podcasts. Podcast resources for women seeking to be inspired, and to learn about or to practice communication skills for leadership and personal relationships, are easy to access. I started my search by using some common search terms such as communication or intercultural competence and categories such as education, politics, or society & culture. 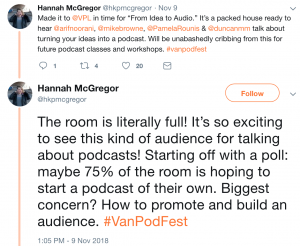 While there are many excellent podcasts about communication and marketing produced by men, such as Terry O’Reilly’s Under the Infloence or from The Communication Guys, Tim Downs and Tom Barrett, in this blog I want to bring your attention to podcasts by women and for women. Here are just a few that I found that you might want to check out. The Rebel Speaker from Michelle Mazur, Ph.D. Many times the mainstreams site don’t cater to your unique situation so please search around the internet until you find a podcast that speaks to your demographic such as this one from Essence Magazine: 13 Awesome Podcasts for Black Women or Her Confidence Her Way by Emiko Rasmussen for a Japanese women’s audience. The above is not an exhaustive list of possible podcasts and it would be great to hear your suggestions in the comments section below. Gender Role and Communication. (2018). In Wikipedia. These were some of the words of the Hon. Senator Murray Sinclair on the release of the Truth and Reconciliation report in 2015. As Canada continues on the journey to Reconcilation with First Peoples, the University of the Fraser Valley is afforded an amazing opportunity for involving students, faculty, staff, administration and all the residents of the Fraser Valley in an art installation that is available from September 13—November 8 in Evered Hall in the Student Union Building, Abbotsford campus. The Witness Blanket: Pieces of History by Carey Newman (Ha-yalth-kingeme) is a large-scale art installation that weaves together hundreds of objects reclaimed from Indian Residential Schools and other related sites in Canada to recognize the atrocities of the Indian Residential School era, honour the children, and symbolize ongoing reconciliation. 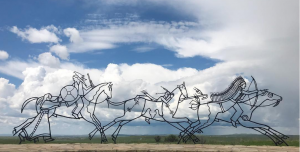 Here are some of the ways that the faculty in the Communications Department have considered as ways to incorporate the art installation into teaching opportunities. – Take a field trip as a whole class to visit the Witness Blanket installation (in the SUB) – Have online students who are unable to visit the installation engage with both the app and the vimeo. As a Canadian, a resident of Canada, or an international student living in Canada what actions can you take to contribute to restoring the balance to the relationship between Aboriginal and non-Aboriginal people in Canada? As an Aboriginal person in Canada how receptive am I to reconciliation? ; and if I am, what can non-Aboriginal people do to demonstrate their willingness to work towards reconciliation?